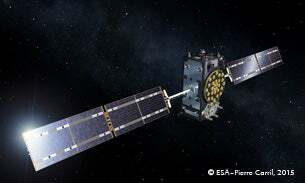 On 11 September 2015, satellites nine and ten of Galileo, the European navigation system, started their journey into space with radio frequency components from HUBER+SUHNER on board. The Galileo project is a joint initiative of the European Union and the European Space Agency (ESA). Galileo is the European equivalent of the American GPS system and the Russian Glonass navigation system. All three systems are mutually compatible. The system will eventually consist of 30 satellites and a corresponding terrestrial infrastructure, and will send positioning data to Earth from an altitude of 23,222km. The first eight satellites have already been put into operation and satellites nine and ten started their journey into space only several days ago. As with the previous four satellites, the two latest satellites also feature radio frequency components from HUBER+SUHNER. To date, HUBER+SUHNER has supplied approximately 4,500 radio frequency components to Thales Alenia Space in Italy for satellites five to 20 of this fascinating project. The Italian subsidiary of the Thales Group uses HUBER+SUHNER adapters to connect the antennas to the active satellite components. The adapters, which were specially developed for this purpose, have an MMBX standard connector at one end and, at the other, a special HUBER+SUHNER customisation for direct soldering onto the antenna. To ensure that all the components are able to withstand the harsh environment of space, they have to pass a wide variety of tests that replicate conditions during launch and in space itself. These include vibration, tensile and temperature tests. One test, for example, involves subjecting the adapters to temperature cycles ranging from -120 °C up to 120 °C over several months. The required performance level must be achieved at the minimum weight because every gram counts. Once installed and in space, the antennas, which are equipped with HUBER+SUHNER adapters, send position data to Earth that is then used to pinpoint the location of individuals or objects. Quality products are understandably of the utmost importance to the ESA, which was one of the reasons why ESA recommended HUBER+SUHNER to Thales Alenia Space for this contract. In addition to the consistently high-quality of HUBER+SUHNER products, other points in their favour were the company’s many years of experience and sound expertise in the aerospace industry. HUBER+SUHNER has acquired an in-depth understanding of this market over decades, and has continued to develop quality radio frequency products for use in a wide range of aerospace applications. HUBER+SUHNER is proud to be a part of this exciting project. The ESA’s endorsement of HUBER+SUHNER is a clear demonstration of its confidence in the quality of the company’s product development and manufacturing processes.